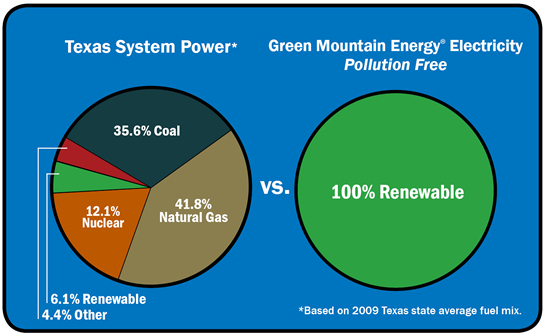 Green energy and pollution free electricity in Texas for Dallas, Houston, San Antonio, Austin and surrounding cities. Did you know the generation of electricity produces more industrial air pollution than any other U.S. industry? That’s why Green Mountain Energy Company was founded with the mission to change the way power is made. only electricity provider dedicated to cleaner energy. Help Protect the Environment with Every Flip of the Switch! your household’s share of carbon dioxide (CO2) emissions.